Marvel at the iconic larger-than-life balloons seen in the famous Macy’s Thanksgiving Day Parade in New York City during the Macy’s Holiday Parade at Universal Studios Florida. This year, enjoy two all-new balloons exclusive to Universal Orlando’s parade, Turkey Balloonicle, a towering balloon with a self-powered vehicle, and Holiday Lights Balloon, as they dazzle guests while floating through the air. Rejoice with holiday cheer as Grinchmas comes to life throughout Seuss Landing at Universal’s Islands of Adventure. 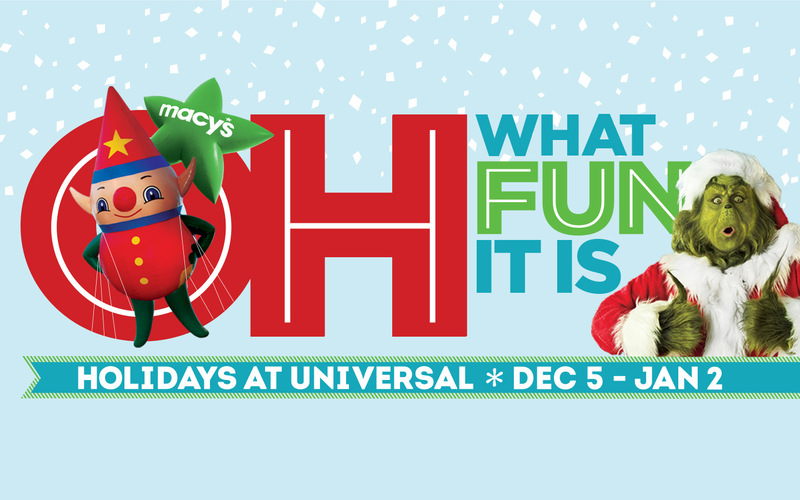 Experiences include a heartwarming live show, “Grinchmas Who-liday Spectacular,” featuring the Whos from Who-ville. Guests will also have the opportunity to dine with the Grinch and Friends during a delicious breakfast within Seuss Landing. Sing along to holiday classics with performances by the masters of modern Christmas music—Mannheim Steamroller—at the Music Plaza Stage in Universal Studios Florida. Performance nights are Dec. 5, 6, 12, 13, 19 and 20. For more information on the Holidays at Universal Orlando, ticket offers and vacation packages, visit www.UniversalOrlando.com/holidays. Portofino Bay Hotel, the Hard Rock Hotel, Loews Royal Pacific Resort, and Universal’s Cabana Bay Beach Resort are destinations unto themselves. Its entertainment complex, Universal CityWalk, offers dining and entertainment for every member of the family. And just minutes away is Wet ‘n Wild, a family water park. We’ve never been to Orlando. It’s great to know about this if we ever plan a future visit! How fun! I have never been to Florida. I cannot wait to see what fun you have this holiday season! Really hoping that I could make it next year, and in 2017 that sounds like an awesome experience. I know that is something me and my son would enjoy. I am with her ^^^. I had no clue those were the actual Macy’s floats!!! We are going to be in Orlando for New Years and still have no plans. Do you think it is too late? And will it be family friendly? not too late and Yes TOTALLY Family Friendly. We did it last year and the Kids LOVED it! I have never been to Universal Studios but would love to go someday. Visiting Harry Potter World is on my must-do list! Sounds like they have a lot of great activities for the holidays. Very cool to have the Macy’s floats in Florida! You get to see the balloons without the cold!